Single Fatherhood is not discussed as much as single motherhood. In some aspects, single fatherhood is more difficult because all the help out there for single parents is geared towards mothers. You can walk into any bookstore and find 100’s of books about being a single mom, how to live as a single woman and so on, but fathers don’t have as many resources and are less likely to search them out. Fathers also cannot breastfeed, they have more difficulty changing their kid on the go (lack of changing rooms in men’s restrooms)*, and are looked at with more skepticism when they have a screaming child. Mother’s can feed on demand, have the convenience of changing stations in their restrooms and aren’t usually stared at when their child is having a meltdown, it is just a normal mom’s position in society. Every parent out there knows this, but it isn’t largely discussed; having a child is a huge pressure on a relationship. Sometimes the stress is too much and mom and dad don’t stay together, thus now thrusting both parents into the single parent role. 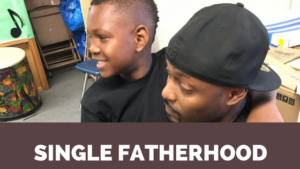 Single parenting is hard, but single fatherhood can be even harder. Boys/Men are pushed to physical activities, sports, video games and other activities that emphasize the testosterone factor rather than to help them learn how to balance it with the more traditionally “feminine” aspects of humanity (Taylor, 2014). Fathers usually take the disciplinary role while mom is the sympathetic one, but when it is just one parent you have to take on both roles. Western society has a culture of shaming, bullying, crass images of masculinity and dismal media portrayals of fathers to teach men that they’re just not going to be successful parents (Taylor, 2014). The role of fathers is evolving, though, and the public is starting to acknowledge their importance not only as breadwinners but also as caregivers. A record 8% of households with minor children in the United States are headed by a single father (Livingston, 2013). In everyday life, the title of Single Father is starting to mean best friend, hero, coach, teacher, listener and more! Fathers teach our children to love and honor others through their own actions and words, they are setting a huge example for our children. Single fathers are typically less educated and less well-off than their married counterparts. They are also younger and less likely to be white (Livingston, 2013). They are usually younger than married fathers, but older than single mothers. Race, age and education all play a role in fatherhood and the statistics, showing while 21% of fathers who are living without a spouse or partner are in poverty, this share rises to 30% for fathers who are living with a partner. There are many obstacles and hurdles single parents face, but society has a hard time with single dads. We need to call to mind that fathers are parents too and most are just trying to raise their child to be strong, healthy individual just like mothers do. Numerous studies indicate that there is much to be gained when children have a secure attachment to their fathers (Philpott, 2013). Remember parenting really isn’t about tomorrow as much as it is about this very moment, the present. Rules are good, but their little hearts, their expectations, their dreams are what it’s all about, so pay attention. The journey of man to loving father does require some turbulence along the way, but it is a journey worth taking. Father’s deserve the respect and awe just as much as mothers; single fathers especially. * Men’s changing tables are coming!